It would be my guess that in the history of food wars, a fair number of skirmishes have taken place in the name of defending what is good and proper in pizza. Flame wars have erupted on discussion boards on chowhound.com over whether a beloved joint’s crust is tasteless or delicious, soggy or cardboardy. Some think that pizza should be on a thick layer of pillowy foccacia-like crust, while others won’t touch it unless it’s crisp bottom bears the char of a wood fired oven. Deep dish or thin crust, sauce, cheese: all topics of passionate and sometimes vitriolic debate. And that’s all before we reach the question of whether or not pineapple in any form ever belongs on a pizza. 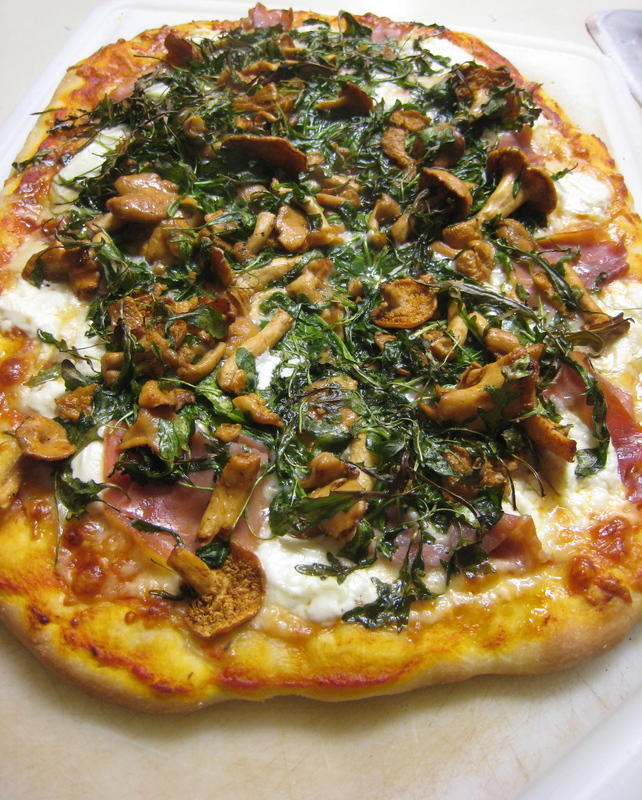 I began this post with the previous acknowledgement in order to explain why my recipe for semolina pizza crust is not being introduced as a polemic. It’s just what I like. Whether or not you recognize my impeccable taste as authoritative is your own personal decision to make. I prefer a thinnish crust that doesn’t collapse en route to the mouth under the weight of its burden. I like a crust that tastes like something, one that is chewy and dense but not ply woody like a frozen pizza crust. I have found that semolina adds a crunchy, chewy texture and more flavor than regular all purpose or bread flour alone. Like I said, just my preference. If any of you are beginning to get an indignantly elevated heart rate or if any hairs on the neck’s back are rising, now might be a good time to look away. Deciding which crust camp to ally oneself with is the first step. Topping philosophy is the next. I’ll confess that the image of a united front that my nuclear family presents to the world is a façade when it comes to pizza topping. Someone in my house (I won’t name names, but let’s just say it’s not me) has big liquid tears pool up in his eyes when pizza emerges from the oven without pepperoni on it. 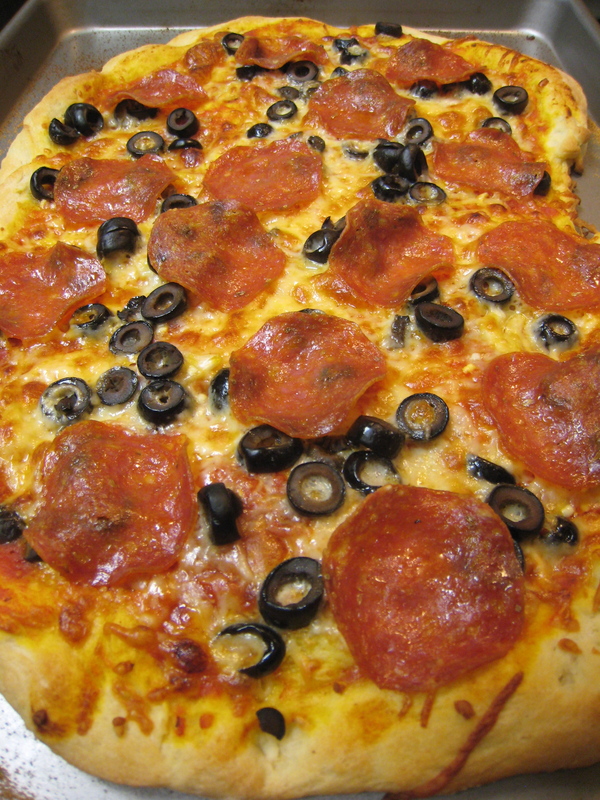 The classic combination of tomato sauce, pepperoni, and cheese with an occasional guest appearance by olives or mushrooms is the preference of what I’ll refer to as the “red” sauce camp. In fact, the comment that I got when discussing the topic of this post was “chicken on pizza is for idiots.” Ahem. In the more liberal pizza-topping (“blue” sauce camp, anyone?) category are those of us who in summer like a skim of olive oil, corn, fresh tomatoes, slivers of onion, goat cheese, spicy sausage and whatever herbs you have in pots on your patio, or in winter, strands of salty prosciutto, hedgehog mushrooms, tomato sauce, arugula, and Asiago cheese blistered and browned from the oven. Unlike the classic formula, which given good ingredients and a couple of reliable tools is almost guaranteed to be successful, experimental versions can sometimes go badly (Pineapple on pizza? Really?) But like the girl in the nursery rhyme, when it’s good, it’s very good. I humbly submit my personal favorite pizza crust recipe. Top it as you see fit. 3/4 cup semolina flour, plus a little more to keep it from sticking to the baking sheet. 1. Pour about half a cup of warm water into the bowl of a stand mixer. Sprinkle the yeast over the water and leave it for about five minutes until it dissolves and swells. Add the rest of the water and olive oil. 2. Add in the flour and salt and stir into water mixture. Use the kneading hook attachment to stir the ingredients until a smooth ball forms and it has pulled away from the sides of the bowl- 5 minutes or so. 5. Heat the oven to 475° and get a large sheet pan out. Sprinkle a thin layer of semolina on the pan and form the dough into a thin rectangle. By grabbing the edges of the dough and gently squeezing, you allow gravity to stretch the dough out. Keep turning the dough around in your hands, squeezing and stretching it into shape. Lay it on the sheet pan and stretch it to fit completely. 6. Top as desired and bake in the scorching hot oven for 12- 15 minutes or until the bottom is golden and spotted with darker brown when the edge is lifted.